Ariana Grande is making headlines again after just achieving her biggest win on the charts to date. Following the release of her fifth album Thank U, Next, the star's latest single Break Up With Your Girlfriend, I'm Bored has topped the Official Singles Chart this week. The track battled against her previous single 7 Rings, which had been at the Number 1 spot for three weeks. The two songs are in the top two positions in this week's Top 40, meaning she has joined a very small group of artists to accomplish this rare achievement. She's also become the first female artist in nearly thirty-four years to achieve this, and the second ever - putting her in the company of mega-star Madonna! Madonna was the first and only female artist to do this way back in August 1985 with songs Into The Groove and Holiday. X Factor: Is the show going to change completely? Ariana Grande fans might have a lot to do with this. 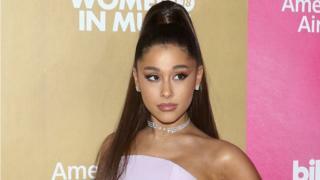 The Arianators took to social media to boycott 7 Rings, which was at number one last week. The loyal fans hoped that the latest single Break Up With Your Girlfriend, I'm Bored would knock it off the top spot and debut at number 1 - and it's happened! 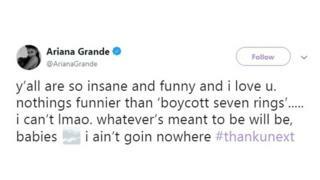 Ariana reacted to the boycott on Twitter, sharing her thanks with her fans. Ariana is having a ridiculously good 2019. Thank U, Next has broken the all-time single week US streaming record for an album by a female artist - over 300 million! Earlier this year she made US chart history with her new song 7 Rings. The singer is the first artist whose first two number ones both debuted at number one, according to Billboard, the people who oversee the American music charts. And if the momentum continues the successful star's latest album is set to become her third Number 1 album, following Dangerous Woman which was released in 2016, and Sweetener, which topped the chart only six months ago. Have you got her new album? We want to know what you think! Let us know in the comments below. Who else has had two top songs simultaneously on the Official Singles Chart? It's an achievement that only a few acts have managed in the chart's 60-year history! Back in January 2017, Ed Sheeran joined the club. His album ÷ was hugely successful and claimed all of the Top 5 spots on the Official Single Chart in the same week. Incredible! 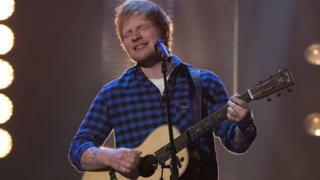 Shape of You was at Number 1 position, and Castle on the Hill, How Do You Feel and Galway Girl claimed the second spot on separate occasions. The other chart topping successes have been The Beatles, John Travolta, John Lennon, Frankie Goes To Hollywood, Madonna and Justin Bieber.